Some moms have had Halloween costumes made or ordered since summer time, when they found the perfect costume on Pinterest, Etsy or Amazon. Then, there are those of us who have 5 days to pull something together for our little one’s Halloween night. 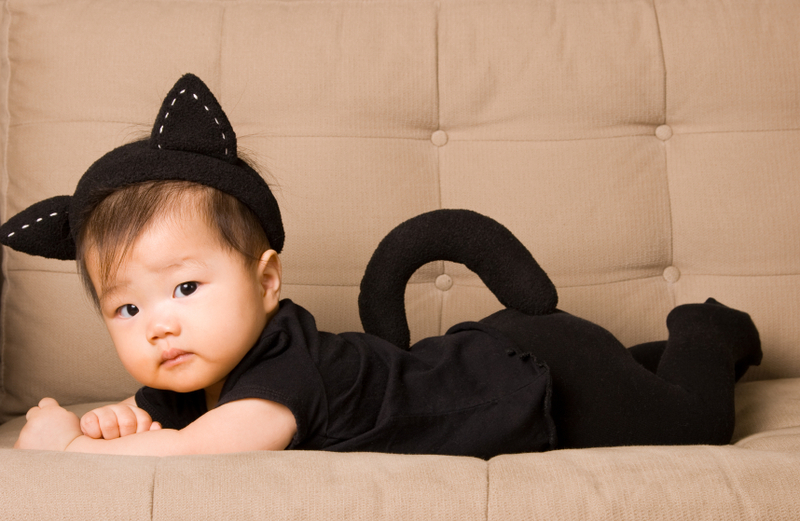 This world takes all types, both the planners and the procrastinators – and we’ve got some last minute Halloween costumes for babies that you can together by Friday night! So, grab some felt, some fabric glue, some cardstock, and get ready to go. Sheepishly easy: Use a white sweatshirt (cut the sleeves off) and glue big, fluffy cotton balls all over it. For the headpiece, take a white knit cap and repeat the cotton balls on top. Using black felt or cardstock, cut out teardrop shaped black ears and attach it to the headpiece. Dress your little one in black pants or leggings and a long-sleeved black tee or turtleneck, and add your fluffy, homemade vest. Dab a little black face paint on your child’s nose, and you have the cutest little sheep in town! Here, Kitty, Kitty: This one is also remarkably easy to do. First, find a sweatshirt and match bottoms in your preferred kitten color – black, brown, tan or white. You can use fabric paint or a marker and draw stripes on the sweatshirt. Then, cut out triangle ears (using felt or cardstock), and glue these to a soft, comfortable headband. Fabric glue a cut-out oval on the tummy of the costume, and you’re almost done. For the tail, you can either find an inexpensive one at the store that has an elastic string to put around your child’s waist. Or, feel free to make one at home, using some old men’s dress socks. Make sure they match your kitty, and stuff them to create the tail. Safety pin the tail in place, and you and your kitty are ready for a walk around the neighborhood. A dab of facepaint and some whiskers and the costume is complete! If by now, you’ve given up on Halloween costumes because you don’t even own any fabric glue, don’t despair! Not every last minute costume has to be created by you. Look around your house, and you’ll probably find plenty of options you never even considered. And, if you don’t want to spend the time or the money hitting the stores and buying a big elaborate costume, picking up a few key supplies at the store can help you complete the look. For example . .
Ballerina Girl: What little girl doesn’t love to put on a fluffy tutu and leotard and twirl around the house? Make your little angel a princess ballerina with items you either already own or can easily find. Add a tiara and even a beautiful cape (which comes in handy if Halloween is a chilly night) and you’re set to dance your way around the neighborhood. Where’s my Mummy: Grab some medical bandages (or even make your own with white-tshirts) and wrap your child up from head to toe. Feel free to use medical gauze or medical tape, or any number of things you can find at your local drug store. It doesn’t matter if it’s not perfect; no mummy (or mommy) ever is! Witches, Ghosts and Goblins: While new things come along like Elsas and Olafs, Box Trolls and more, some things never go out of style when it comes to Halloween. Take a sheet and make a creative ghost – or even a traditional ghost with the eyes cut out. Dress your child in some black, brown and green, add some fun, slightly scary face paint and maybe even a crazy wig (or make their own hair a bit crazy), and you’ve got yourself a goblin. And, what Halloween would be complete without a little witch or two. A black outfit, dress or cape, coupled with a hat and broom, and you’re ready to stroll the neighborhood, casting spells and collecting Snickers bars. With Pinterest, Facebook and all this creativity on-line, sometimes it seems like Halloween is more about keeping up with the Jones’ than actually having fun. But, remember, this is the same little one who is happy trying on your shoes in the closet or wearing Daddy’s big t-shirts; the child who loves to run around the house naked, wearing a tutu. Finding the right costume, even if it is the night before Halloween, is all about finding something that your child will enjoy – and that will put the smiles on their faces that make it all worthwhile! ← Natural Essential Oils for Babies – Are They Safe and Healthy?